dTective® 8.0 made a big splash at the LEVA conference last week and was officially released on Monday. dTective® 8.0 includes our updated SpotLight/Redact effect and our new Analyze (BETA) effect. SpotLight/Redact is an effect that allows you to highlight and/or obscure up to four (4) separate areas within your video clip via one effect, saving time when highlighting/obscuring multiple objects. SpotLight/Redact can darken, lighten or apply one of several effects (e.g. mosaic, blur, scatter, etc) to the entire video background, as well as inside of each of the four SpotLight target areas independently. Target area styles (e.g. border color, inside settings, etc) can easily be copied from one SpotLight to another, and we’ve added optional animation if you’d like to have the SpotLights Fade or Wipe In/Out. We’ve also added a brand new effect as a BETA release in dTective® 8.0 called “Analyze (BETA)“. This effect allows the user to define a region of interest within their clip, then scan the clip for activity in that region. 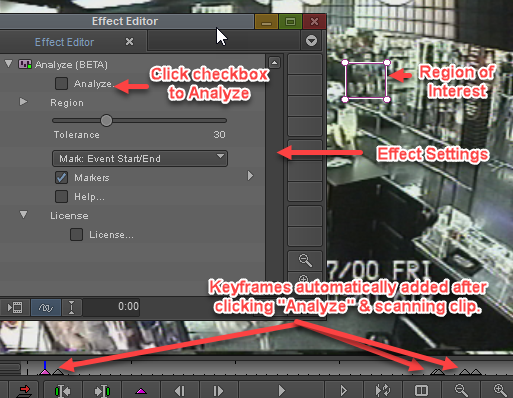 After processing, the effect automatically adds keyframes where activity is detected, so the Analyst can quickly review each and add Markers with notes if appropriate. Analyze (BETA) performance will vary based on many factors including hardware capabilities, source media, defined Region of Interest (RoI), tolerance settings and more. The lower the tolerance, the more results will be returned. This is largely why we released it as a BETA; we want it used on a wide variety of systems and media, and hope that you’ll provide us with some feedback via our Feedbak & Suggestions Form. dTective® 8.0 is FREE to all of those in support as of 11/1/2018 and is immediately available for download! Posted in Ocean Systems Blog and tagged Analyze (BETA), avid, ClearID, detective, dTective, forensic video analysis, media composer, SpotLight, SpotLight/Redact.